This week, I’d like to share my review of the Crisis on Umbara flashpoint and story. I’ll divide this post into two sections, the first is spoiler free and the second shall delve deep into spoiler territory. Crisis on Umbara is well done and is everything I want from a flashpoint. The designers did a fantastic job with the new environment, and filled it with a neat variety of new creatures and foes. Crisis is filled many cool moments, from moving through and over the train cars to escaping the crash and exploring the purple, glowing Umbaran terrain with its weird creatures including half-dinosaur, half-mantis predators and an enormous and terrifying iridescent landshark of a boss. Each boss encounter is distinct and all the fights require some understanding of mechanics, regardless of mode. Solo and Veteran mode are appropriately forgiving, but while I wouldn’t say they are tough, these modes require a bit more personal responsibility on the part of the players than most other flashpoints. I’m okay with that. Crisis’ Solo mode is the first not to include the GSI Support Droid which is so ridiculously powerful that it makes the players irrelevant and we end up more spectators than participants in the action. In my book, this change is a good one, and while I haven’t run solo mode to death, it feels on par with a tougher planetary heroic, which is where I’d imagine it should be. Master Mode, on the other hand, is no joke; it is easily the most difficult Master Mode Flashpoint in the game. Because of real life concerns, my usual crew hasn’t yet seen the final boss, but so far fights are big and satisfying challenges, as they should be for the toughest mode. I do have some nits to pick however. As cool as Umbara is, I do feel like it should be darker. While the first third takes place on a high-tech train, and it’s reasonable that the outdoor boss areas be illuminated, I wish the rest of the environment had better evoked the world’s appearance in The Clone Wars where the characters were often seen in silhouette and it seemed monsters could jump out of murky shadows at any moment. Umbara’s shadowy nature is right there in its name, but both Ilum and Imperial Taris are darker, and when I recall how well another flashpoint, Kaon Under Siege used darkness, it makes me think Crisis could’ve used a bit more shadowy atmosphere. I do want to discuss the rewards. I discovered the hard way that the Umbara stronghold was the first to be released that also did not come with an increase in the cap on the maximum number of strongholds, so I am not yet able to purchase it. Because of my attachment to the other strongholds and the time I put in decorating them, I don’t think I’ll be unlocking Umbara until the cap is raised. Given my fondness for decorating, this is a bit of a bummer. As for the other rewards that can be purchased with Alliance Recon Data, what we have is nice. I like the armor set, and a friend whose main character is a biochemist was overjoyed to see the return of reusable stims, medpacks and adrenals. That said, there should be more. The flashpoint currency is character, not legacy based and has a weekly cap, but the value of the currency can vary widely between different characters. If you don’t have biochem as a crafting skill and don’t want (or already have) the stronghold, there is little else worth saving up for. No recipes for other crafters, no weapons, no dyes, no decorations. It is very easy to get to the point where Recon Data becomes useless to players. While I think that should happen eventually, it shouldn’t be after only a run or two. I am glad to see that the bosses drop decorations, and that the drop rates are not ridiculously low like they are in other flashpoints, but I must say that I’m not at all a fan of the fact that the decos are holograms. 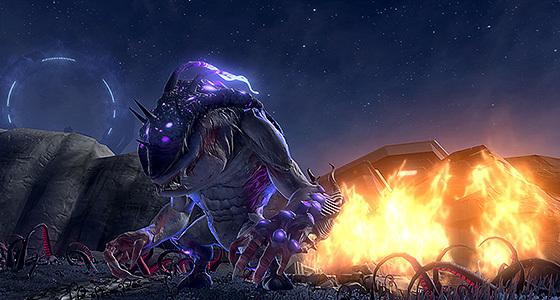 I want an actual alien landshark in my stronghold, not a holographic one. Once again, the achievement rewards are also anemic. Where are the trophies, the titles and other weird stuff to work towards? Crisis on Umbara is the only flashpoint without a trophy decoration. What’s up with that? Maybe I’m in the minority, but I’d rather have a trophy to hang on the wall of my stronghold than 20 Cartel Coins. 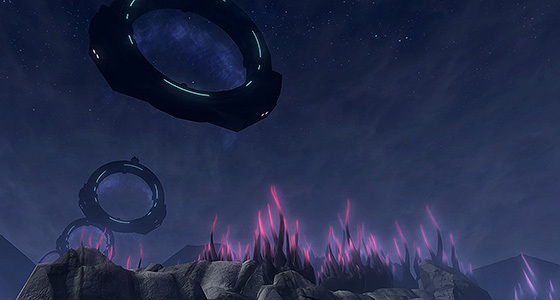 I made the same points regarding rewards and achievements in my review of the Iokath dailies. 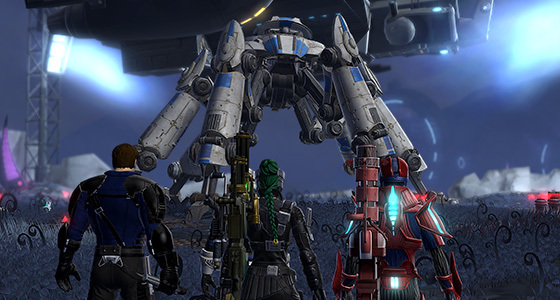 SWTOR has done well with these things before, and I think it’s fair to hold new content to those same standards. I’d also like to see specific loot attached to the Master Mode version of the flashpoint. Because of the limited use for Alliance Recon Data, there should be extra incentives to run the flashpoint in its toughest mode. Given the 242 gear requirement and difficulty of the encounters, I don’t know what type of gear drops would be appropriate, but if I had a shot at a cool, rare vanity item, I’d gladly run the flashpoint again and again. Part Two: Who Spoils the Spoilers? The revelation of the traitor’s identity was probably and unfortunately the worst kept secret in recent SWTOR history. I’m probably being over-cautious to wait more than week before writing about it, but I’m sure there are many folks who don’t follow the SWTOR gossip and news as closely as I do. I figure better safe than sorry. That said, let’s dive in! I managed to avoid having the traitor’s identity spoiled, but the general level of freak out in my social media feed pretty much insured that the traitor could only be Lana or Theron. Once I started the story, it was clear within the first dialogue scene that it was going to be Theron. So I can’t say I was shocked by the reveal. Another reason I wasn’t that surprised is because it makes perfect sense that Theron is the traitor. I mean, of course, he is. I like Theron Shan a lot, but the guy has enough issues to fill a comic book collection, and he chose a profession where betrayal is a part of doing business. First off, if the Outlander has made Dark Side choices or is even a little Sithy, the only surprise should be that it took Theron so long to make the heel turn. Nevertheless, even if your Outlander is like mine and made every Light Side choice, saved every unicorn and hugged every kitten, I buy Theron’s defection too. To him, that Outlander might seem too good to be true, and it’s not a stretch that he would pre-emptively self-sabotage the relationship. Why wouldn’t he? Ever since we first met Theron back during Rise of the Hutt Cartel, it’s been clear that he has chosen to nurse his abandonment and trust issues rather than deal with them. Screwing things up is kinda what Theron does best, so I don’t think it’s out of bounds that he’d betray the leader of an Alliance he helped build. I know Theron has many ardent fans, and I write this not to slag him. This stuff is what I like about Theron. It’s what makes him an interesting character. He may think he’s the James Bond of the Star Wars universe, but his Member’s Only jacket and faux-hawk reveal the truth that he’s really just a dork like the rest of us. Do I think Theron has really betrayed the alliance and the Outlander? No. No, I don’t. There are two or three hints in the Crisis on Umbara story that pretty strongly suggest that he has done all this to infiltrate the mysterious Order. Indeed, going off half-cocked without checking with friends and allies first is another signature Theron Shan move. It’s exactly what he did on Ziost, and I think it’s what he’s doing here. That he wouldn’t let the Outlander know ahead of time makes sense to me given those trust issues I mentioned earlier. We’re still in the earliest stages of this new story arc, and I’m reluctant to draw too many conclusions. We are certain to learn before long who and what “The Order” is but I’m not sure we have anything to go on at the moment. Beyond the return of Malgus anyway. I think it might be interesting if the sincerity of Theron’s betrayal hinged on the choices the players has previously made during Knight of the Fallen Empire and Eternal Throne, but I suspect that might be a bit much to ask of both Bioware and the players. It seems to me that Crisis on Umbara has got folks talking, jump started the next chapter of the story and has me curious to find out what happens next, so I’ve got to give Bioware thumbs up on this. Then again, I would’ve figured Theron for a Hawaiian pizza guy, so what do I know?